As parents we often wonder whether we’re doing a good job. I feel as parents to children with autism we can be even harder on ourselves, always wondering if we’re doing enough, even if someone else could do a better job. I know in our more difficult days I’ve thought that often. Then, you realise it’s not about being perfect. What is a perfect parent anyway? Here, Kevin O’Neill, (another UK dad blogger!) 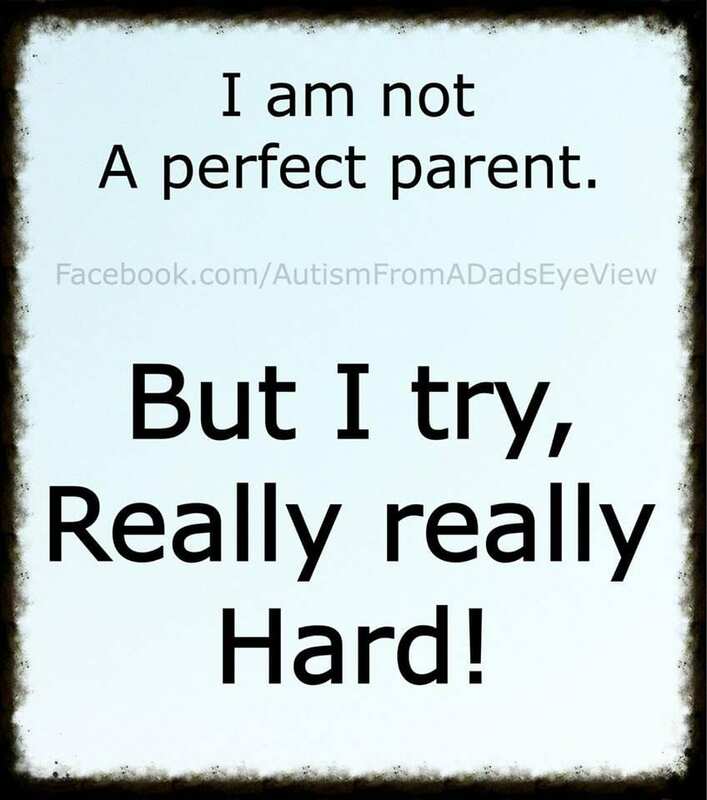 from the very impressive Facebook page Autism From A Dad’s Eye View, shares with us an insight into his family life, and why not being a perfect parent is ok. I sometimes overlook Connors specific signs of a ‘meltdown’ coming, because Aiden is a far bigger presence in our house! Connor can be spoken to and respond. But sometimes I forget that he also can’t fully control the anxieties building up inside him! We were trying to do his math homework. But we couldn’t even get to the table… A fight broke out between me and him. He went on raging about random stuff! And I was there ‘demanding’ he sit and do his work. I saw this was going in a bad direction, and sent him off to do his calm down techniques… this was not working either! So I tried the distraction technique – jokes and tickles. Yes he laughed and smiled, but the rage inside him was still there. We both lay on the floor at the bottom of the steps, heads together. I was just trying to bring his emotions down to a calm level. He was just trying to tell me how ‘angry inside’ he was feeling. And when we got to the point of civil conversation, I suggested we go do the math homework………. Deep pressure hugs from me this time. He turned and said ‘I’m going to my room’ OK I said, but not to play! NO he said, I just want to relax. So. Yeah. I need to work a bit more on my parenting. And will for as long as I need to, and then some more. None of us are perfect parents, and many of us carry a lot of guilt around. You just have to do the best you can do, for your kids. Sometimes space and time is what’s needed most – for all of us! Just visited here for the first time, and read the above – hats off to you! I think you handled it admirably, and far better than many, yet still you’re looking for ways to improve your dealings with Connor, and that’s incredible. All too often I wail “I’m trying my best” but here you are doing amazing, far better than most, and still trying to improve. Go you.